I am working at Vetokonsultit Oy. I have been working in the company part-time during 1991 - 1993 and 1996 - 1999 and full-time since 1999. Project references are at the end of this CV. I was an assistant at the Operating Systems course of HUT in 1999 & 2000. I participated in the Lego Robot as a Museum Guide project in 1999 & 2000. 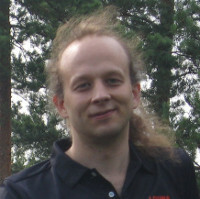 I completed Master of Science studies in computer science at Helsinki University of Technology in 2004. Master's Thesis: Concentrating Common Functionality of Different User Interfaces into an Application Server. I got my Finnish 'Ylioppilas' certificate with four Laudatur's in 1994. Accomplished in 1995 at TiedPsto/TykPr and TjPtri/RUK. Military rank: second lieutenant. Special military education: artillery fire control, artillery measurement reconnaissance, intelligence officer. I was the president of POLLUX in 1997. I was a member of the board in 1994, 1996 - 1997 & 2002. (POLLUX is students astronomy, space & rocketry club). I'm now a honorary member of the club. I was the secretary of TRIP in 2002. (TRIP is students sailing club). I am official Rocket Master, nominated by Finnish Astronautical Society. I have participated in the Skunk Rocket Project since 2006. I was the president and treasurer of the society during 2008 - 2010. I was a member of the board during 2003 - 2010. I have been a member of the board of a housing cooperative since 2010 and I was the president of the housing cooperative in 2011. I have been performance auditor of Meditaatiokellarin ystävät ry since 2014. Customer projects, in which I have worked for more than 20 hours a year. or non-public organization with more than 200 employees.